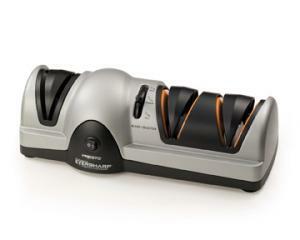 Get professional results at home with this three-stage knife sharpening sharpening system. Sharpens kitchen and sporting knives, even Santoku knives to a razor sharp edge. Stage 1 begins the sharpening process with a Sapphirite** coarse-grinding wheel to create the proper angle. Stage 2 continues sharpening with a Sapphirite* medium-grinding wheel that gives the blade a precision edge.